Balder dreamed of his own death, and the dreams of gods are prophetic. So Freya, his mother, went all about the earth extracting a promise from all things that they would not harm the god. The only object that would not agree was the mistletoe, an unimportant exception, because how could something so small and insignificant be harmful? So, one day, the Aesir devised a new game, whereby they would throw things at Balder. Arrows, darts, rocks – all diverted themselves so they did no harm to the beautiful god. Hoder, being blind, did not play. So Loki pulled him by the hand and gave him a dart and guided his hand to play too. Out of jealousy and spite, the dart was made of mistletoe. Hoder’s aim was true, and the dart struck Balder in the heart. He fell over dead, and the Aesir in their grief tore Hoder to pieces, They built a mighty pyre for the beautiful god of light, and threw the pieces of his murderer onto it. As they built it Nanna, Balder’s wife, died of grief, and was burned on the same pyre. Odin bent forward into the flames and whispered a promise to his son. No-one else heard, but it was later known that the promise was for resurrection after Ragnarok. Freya went down to the underworld. Hel promised to release Balder from her court if all objects alive and dead would weep for him. So Freya went across the earth asking each thing to cry, and all did, until she came near the end of her journey and found a giantess. “I know him not.” said the wicked old giantess, which was Loki in disguise. 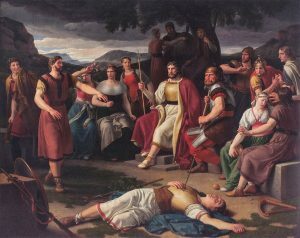 Thus Balder had to remain in the underworld, not to emerge until after Ragnarök, when he and his brother Hoder would be reconciled and rule the new earth together with Thor’s sons. Balder is a good model for a tragically fated figure. He makes a suitable patron for paladins, particularly those who hunt monsters (giants) instead of undead. It is unlikely there would be separate temples to Balder, but a shrine in a greater temple complex might be guarded by lios-alfar – the prototype of High Elves. Treasures might include illuminated manuscripts or an enchanted lantern. Because someone will ask, there is no connection between the god and Baldur’s Gate in the Forgotten Realms. There are only so many names. If you like the idea of building pieces of history into your games, join us at Jigsaw Fantasy where we make setting modules designed to tie into both established settings and real myths.